Description: The Putt to a Coin Drill trains you to become deadly accurate with your putts by helping you narrow your focus down to a spot even smaller than the hole. 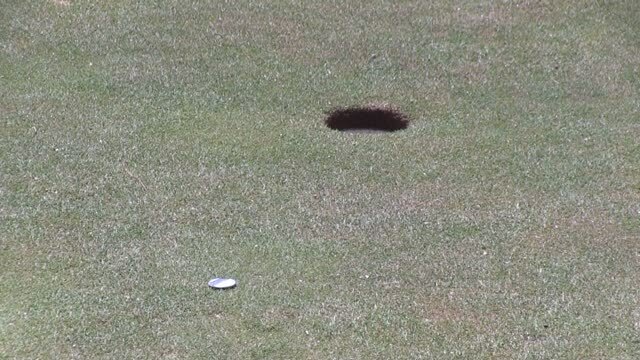 Put a coin on the green and putt to it instead of to a hole. Practice putting to the coin from varying lengths of putts and types of breaks to help narrow your focus to a very specific target. A variation of using a coin is to put a tee in the back of the cup so you are trying to hit a smaller part of the cup, not just get the ball in the hole. Practice the Putt to a Coin Drill to become more accurate on your putts. By focusing on the coin and working on rolling your putts to that coin, you tighten your focus and then will have more room for error as you roll putts to the actual hole.